A few days after naming our daughter Brooklynn, we started calling her Brookie. We were eating cookies and Brandon held one out to her and said “Hey, Brookie, Brookie, want a cookie?” Lol! And that is how we nicknamed her Brookie. We’ve had the name Brooklynn picked out as our girl name since before Baker was born and it was our top pick for a girl if at least one of the twins would have been a girl. So when we were confirming name options this last go round, Brooklynn was of course at the top of our girl list. We tried exploring other names, but always came back to Brooklynn because we love it so much. And now that Brooklynn is here, we know it was meant to be her name. 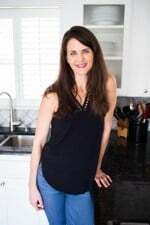 As we anxiously waited for each baby (babies in the twins’ case) to be born, I would think about each name we had chosen and what we might call them if not by their name…nicknames, ways the name could be shortened, middle names, initials, etc. I still can’t believe Brookie never came to mind when I thought about the name Brooklynn. I just thought if we ever called her something different, it would be Brooke. And we haven’t even called her Booke once. 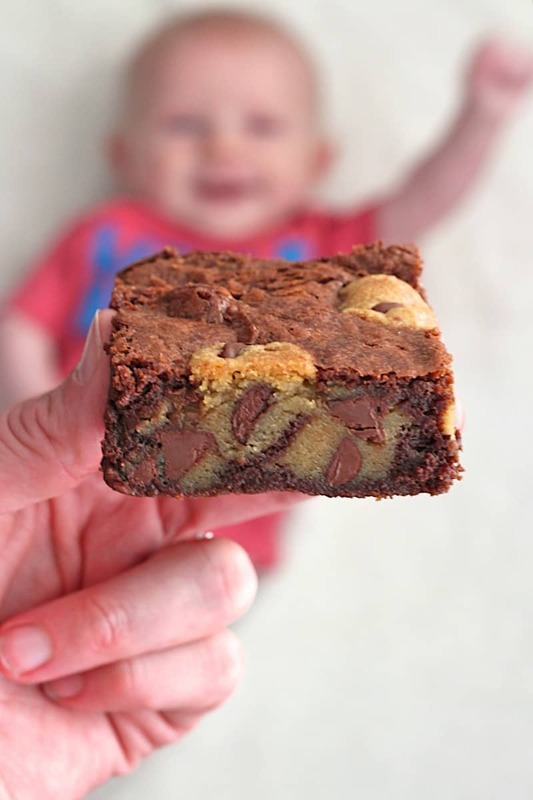 I can’t believe I didn’t already have a great Brookie recipe here on the blog. 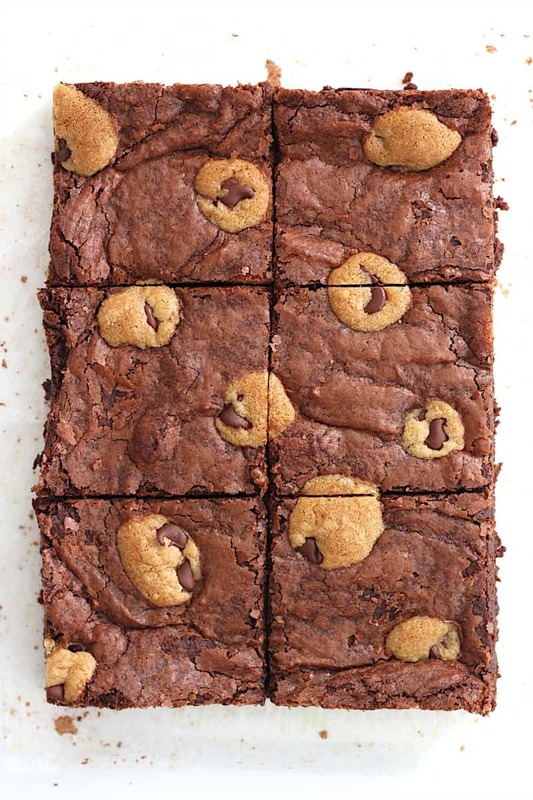 We’re a cookie and brownie loving family that always has a hard time deciding which we love more. I’ll usually bake both because I just can’t decide. So why oh why have I waited so long to combine them into one awesome treat that has quickly become a family favorite?! 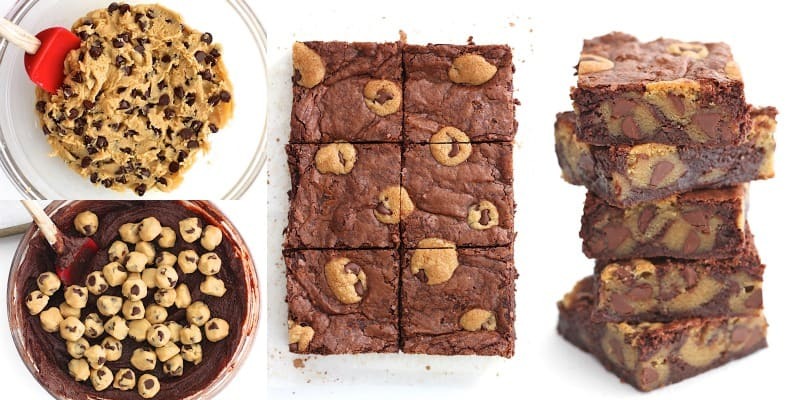 These Brookies are out of this world amazing! 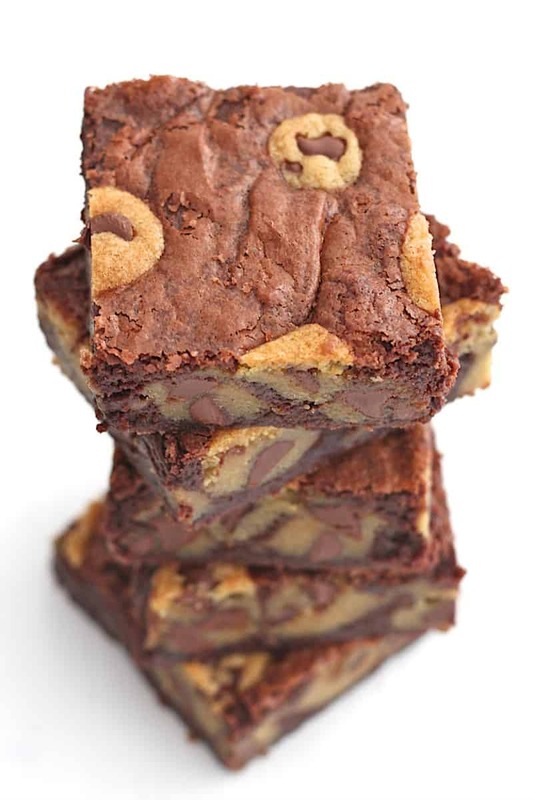 Of course, not as amazing as our sweet Brookie, but pretty darn amazing and they’ve quickly become my go-to baked good for any occasion. 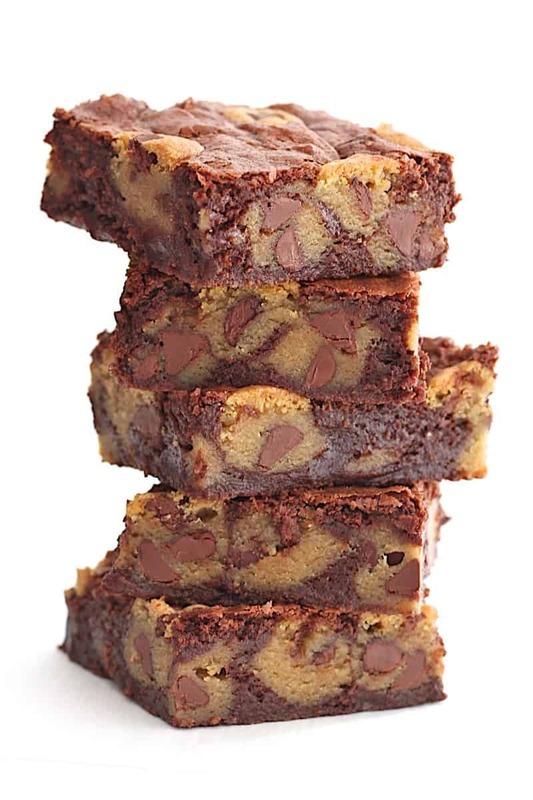 Chewy chocolate chip cookies nestled in rich fudgy brownies with that perfect crackly top. What more could you ask for?! 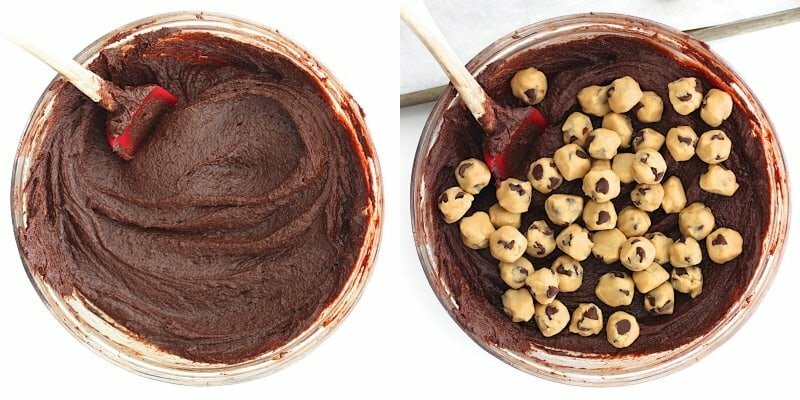 First, you’ll stir together the cookie dough and form it into little 1 teaspoon sized balls that you’ll freeze while you stir together the brownie batter. In the same bowl you stirred the cookie dough in, you’ll now stir together the brownie batter. After the cookie dough balls have set in the freezer for at least 10 minutes, you’ll gently fold all but about 15 of them into the brownie batter. 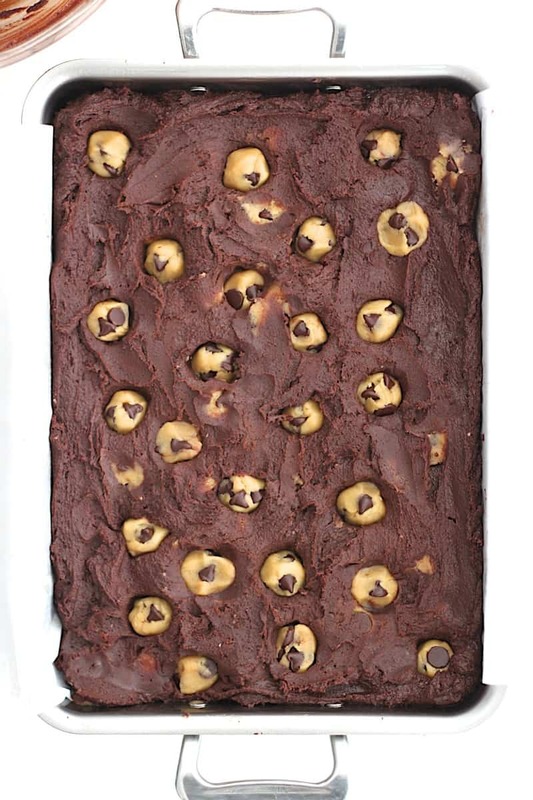 You’ll then spread the batter into a parchment-lined baking dish and press the remaining 15 cookie dough balls evenly into the top of the brownie batter. Bake for about 35 minutes or until a toothpick inserted in a few spots throughout the middle comes out clean. Let cool completely in baking dish before lifting parchment paper and slicing into squares. Thanks for inspiring our new favorite treat, sweet girl! Why choose when you can have the best of both?? Hope y’all bake and enjoy them as much as we do! Preheat oven to 350°F. 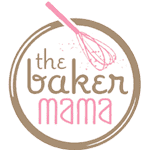 Line a 9x13-inch baking dish with parchment paper and lightly spray with non-stick cooking. Set aside. 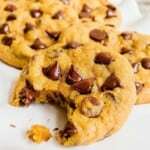 Cookie Dough: In a large microwave-safe mixing bowl, melt ½ cup (1 stick) butter for about 1 minute or until melted enough to easily whisk. Whisk in brown sugar and granulated sugar. Add egg and vanilla and whisk until well combined. Stir in flour, salt and baking soda. Fold in chocolate chips. 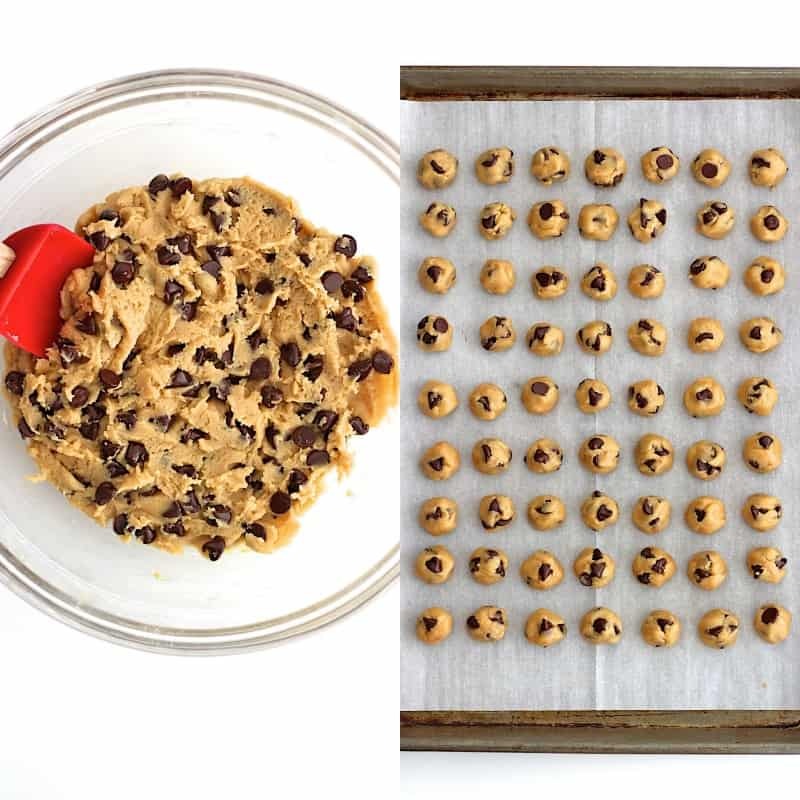 Form cookie dough into teaspoon sized balls and place on a parchment lined baking sheet. 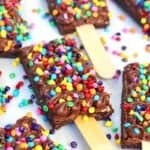 Place in the freezer while preparing the brownie batter or for at least 10 minutes. Brownie Batter: Scrape bowl clean of any cookie dough. Place 1 cup (2 sticks) butter and 2 cups chocolate chips in bowl and microwave for about 2 minutes or until melted enough to whisk smooth. Whisk melted butter and chocolate chips until smooth. Add sugar and whisk until well combined. Add eggs, one at a time, whisking after each one. Gently whisk in vanilla and cocoa powder until well incorporated. Add flour, baking powder and salt and stir with a spoon until a smooth thick batter forms. Remove the cookie dough balls from the freezer and gently fold all but about 15 of them into the brownie batter. Spread batter evenly into prepared baking dish. Press the remaining 15 balls of cookie dough evenly throughout the top of the mixture. Bake for about 35 minutes or until a toothpick inserted in a few spots throughout the middle comes out clean. 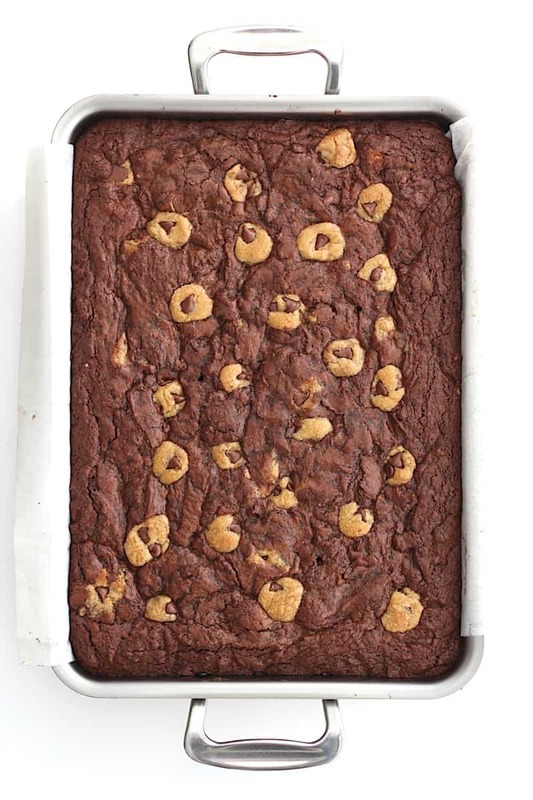 Let brookies cool completely in baking dish before lifting parchment paper and slicing into squares. Soo cool. Having a recipe after your daughters name. 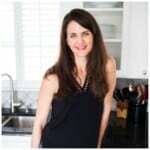 More than being an inspirational baker. U have made me look forward excitedly to being a mom. I have my first baby due in 4 months and i hope i can pull it off like u do, meagan !! A fun treat for an adorable, sweetie little girl – perfect! Our little Brooke was born in January. We pretty much only call her Brookie. I don’t really bake, but I guess I have to make some Brookies! Maegan, These look great, I can’t wait to try. I love the story and background that goes with them. Thanks for sharing. I love these! I’ve been looking for a good Brookie recipe, but was hesitant at creating two separate layers. Do you think your recipe would work baked in cupcake tins? I have heart-shaped silicone pans I want to use for the holiday. Thanks! Hi Kristen! Yes, it would work great baked in cupcake tins. Just mix the batter as normal and divide evenly among the cupcake tins still reserving at least one little cookie dough ball for each tin. You would just need to watch the baking time as they will bake faster in cupcake form. Enjoy! I will try. Sound good. 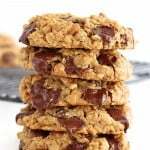 Hi- these look delish, do you think this would work with a different chocolate chip cookie recipe? I have one that I absolutely love so was wondering if it would work the same way! thanks! Hi Regina! I couldn’t say for sure because I’m not familiar with the ingredients in the chocolate chip cookie recipe you want to use or the process for baking them. 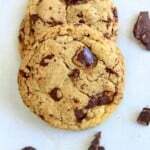 This chocolate chip cookie dough recipe was developed specifically for this Brookie recipe. It’s certainly worth a try though if you think your favorite recipe is similar. I hope it works just as great for you! 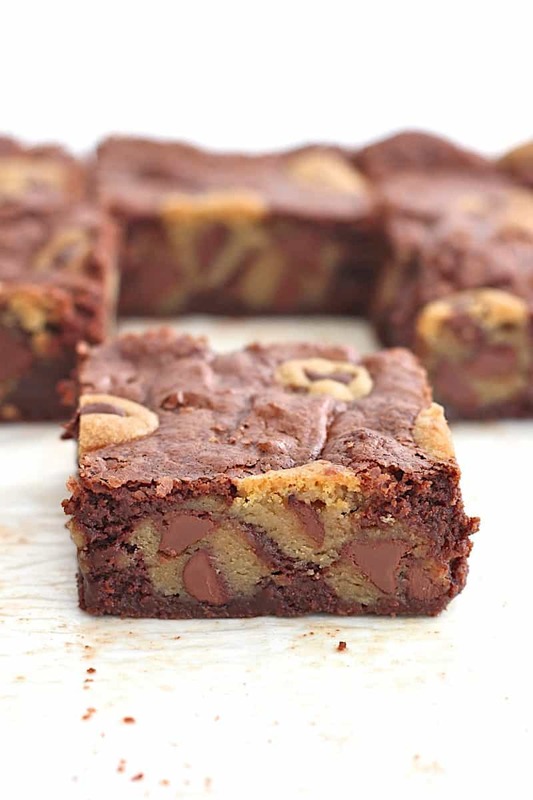 Would this work with boxed brownie batter for a 9×13 pan? Hi Shelly! It should work just fine. I’m not sure the exact difference in the amount of this homemade brownie batter vs. a boxed mix batter, but I think it’s pretty close so the texture of the Brookies should still turn out. Hope this helps and enjoy! Just wow! 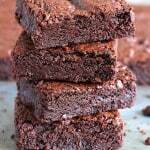 I tried this recipe for my sons’ school charity bake sale and it’s scrumptious. I think my boys will eat most of this batch. Will have to make a double batches. The texture is just right. I did bake it an extra couple of minutes as my oven is temperamental. I tested them at 33 mins and the batter was wet in the center but not on the sides. So I let it stay for an extra 3-4 mins. Love it, Rabia! Such a great recipe to bake for a bake sale. The best of both! Thanks so much for sharing & best wishes at the bake sale. Enjoy! Omigosh, these look soooooooo good! They do look kinda complicated, but I’m 1000% sure the effort will be well worth it! I am going to try to make these for my daughter, Brooke’s kindergarten teacher on the first day of school! Brookies from Brooke! Maybe it will become a first-day of school tradition! Thank you! Yum! I want to make these..can i ask though, what is the point of parchament paper underneath? Is this is a secret trick or just help on the removing process? I’ve always wondered? !😊😊 thanks! Hi Ashley! Yes, I use parchment paper to help prevent them sticking to the pan and to easily lift them from the pan to cut them into bars. Enjoy!